Always in need of dessert.. This saved me last night. It’s super super easy! I simply cut the banana and scooped a little bit of almond butter onto it. I made little banana & almond butter sandwiches. I tossed them onto a plate and put them in the freezer for an hour. Wam Bam thank you fruit- dessert. 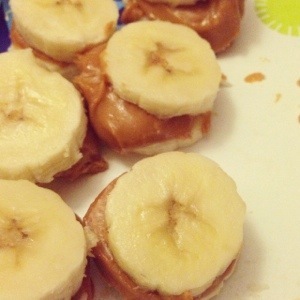 This entry was posted in Dessert and tagged almond butter, banana, dessert, paleo, paleology. Bookmark the permalink.